I feel a bit ashamed to admit this, but I am one of those people who judge a book by its cover. This is particularly true when it comes to cookbooks. Maybe I am a bit shallow when it comes to these things, but I just can't seem to help myself. I'm a visual person. I need the pretty pictures and lovely layout. Well, maybe I don't need them, but I certainly want to have them around. I think, secretly and deep down, you do too. I was in my local bookstore this weekend when I spotted a gorgeous cookbook in the bargain section. A loaf of bread on the cover caught my eye, gave a little wink, and I was immediately smitten. After paging through it in its entirety (do you do this too? ), I knew I had to have it, if only for this Chocolate Cherry Bread recipe. Well, this weekend I tried out a couple recipes and I've decided that maybe being pretty isn't what it's cracked up to be after all. I loved the ideas in the book but, in reality, the recipes didn't measure up. They were poorly written, the method for baking some of the bread was off, I questioned the quantity of certain ingredients, and I didn't love the finished product. It was edible, yes, but that's not exactly my criteria for sharing recipes with you. I ask more of my food than simply being edible. Nevertheless, I took the idea of the Cherry Chocolate Bread and ran with it. On the second try, this beauty was born. 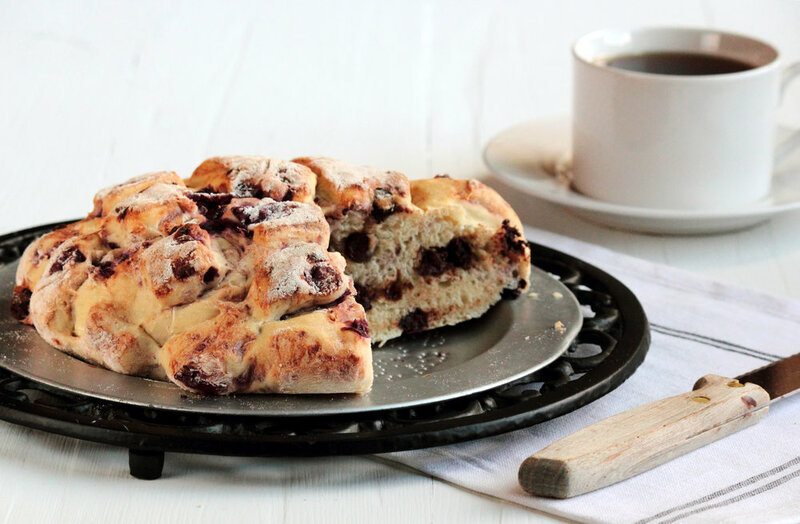 Stuffed with cherries, chocolate chips, and a hint of delicious, the idea for this bread was worth the cost of the cookbook. Which just so happens to be $7.10. This Chocolate Cherry Bread is, no doubt, a dessert bread. It makes for a seriously decadent snack (or breakfast, if you can't resist a bite or two). This bread is made with yeast, which brings a light quality to the bread and great flavor. Chocolate chips and dark sweet cherries are kneaded into the dough before baking and litter the finished product with pockets of decadence. 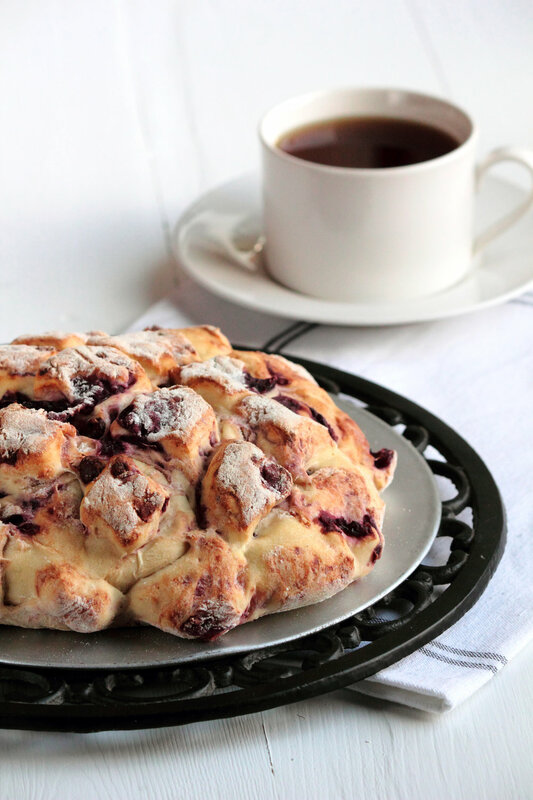 Happily, this bread uses canned cherries so you don't have to wait a year for cherries to come back in season (no one should have to wait that long in anticipation). This bread does not need anything to taste delicious—no butter spread, no jam. It is perfect just the way it is. In a large bowl, stir together flour, salt, butter, and yeast. Add the water and mix by hand (or dough attachment with stand mixer) until dough comes together. If dough is too dry or not holding together when pinched, add more water 1 tablespoon at a time until the dough behaves. If using a stand mixer, knead with dough attachment for 5 minutes, or until dough is elastic. If making by hand, knead dough on a lightly floured surface for 5-8 minutes, or until dough is elastic. Place in a lightly oiled bowl, cover with plastic wrap or a clean kitchen towel and allow dough to rise for at least 1 hour. When dough has risen, place on a lightly floured surface. Divide dough in half to make two loaves. Knead 1/4 cup chocolate chips into each loaf. Add 3 ounces dark cherries to each loaf and work in. The dough may become soft or wet. Add more flour if this happens (I added a few more tablespoons flour to each loaf in order for it to hold shape). Place each loaf on a parchment lined baking sheet, dust lightly with flour, and score with diagonal lines in a criss-cross pattern. Cover with a clean kitchen towel and allow to rise for an additional hour. Bake loaves for 20-25 minutes, or until lightly golden. Transfer loaf to a cooling rack to cool completely.